Since my post talking about the frustration in talking about making government more transparent, participatory, and collaborative, I had an epiphany. We are all Dorothy Gale. 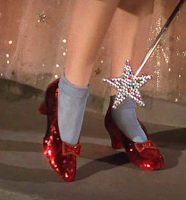 Dorothy, from the Wizard of Oz, wore magical ruby slippers that empowered her to do what she most wanted--return home to Kansas. BUT she couldn't unleash their power until she believed that she could. Crazy, no? How did our heroine get to believing? Via real life experiences. 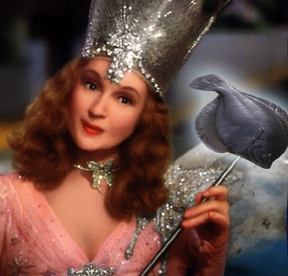 So, for Halloween I will be a Good Witch and provide guidance in the form of examples of real agencies solving the problems in becoming the government that we want to be. Call it the Yellow Brick Roadmap. So, what are the barriers and what are solutions that agencies have found? [T]hese third-party websites are not a part of the Department’s internal information systems nor will they be operated by a contractor of the Department, the Department does not and will not collect information from individuals when individuals interact with the Department’s social web accounts. While it may appear that information posted by third parties on the Department’s accounts is the Department’s information, such third-party postings are technically and factually under the dominion of the third-party social websites. DOJ's construct may be a good model for other agencies. Read the PDF of Justice's Privacy Impact Assessment. As the technology evolves, this order and its accompanying handbook will evolve, but in general terms, this order defines guiding principles for use of these technologies by GSA employees. The use of social media technology follows the same standards of professional practice and conduct associated with everything else we do. Common sense and sound judgment help avoid the most vexing issues. Read the PDF of the GSA Policy for Employee Use of Social Media. Legal barriers in standard 3rd-party terms of service agreements: This was the original show-stopper for many agencies trying to use social networks. The federal government could not agree to some clauses in standard agreements with social media service providers. Since this problem was identified a year ago, government-wide agreements have been negotiated with You Tube, Flickr, Facebook, MySpace, and more with additional agreements in the works. This has been a collaborative effort with many agencies contributing time and lawyers including EPA, Commerce, GSA, Library of Congress and the White House. While each agency will decide when and how to implement social media and social networking tools based on their priorities and strategies, a basic legal hurdle for all government has been cleared. See more on the process for using standard terms of service agreements on Webcontent.gov. Strategy and process: Frankly, another barrier has been, how do you get started? A terrific model for people to learn from is provided by The Smithsonian, the world's largest museum complex and research organization. This Smithsonian Web and New Media Strategy was created through a fast and transparent process that directly involved, and continues to involve, hundreds of stakeholders inside and outside the Institution. This strategy will feed into the Smithsonian’s comprehensive strategic plan, currently under development. I'll quick stipulate that the Smithsonian is not a typical government agency, yet their approach can be modified to fit the culture and needs of any agency. First, tie new media to the agency strategy. Second, appoint a leader with decision-making authority. Third, create a tactical road map. Fourth, create a funded unit that will implement the strategy. Before people [you!] start to moan about how hard this is, nobody said it would be easy. The Smithsonian, however, is showing a way. See all the details at the Smithsonian Web and New Media Strategy Wiki. Transparency & Open Government. While the long-awaited Open Government Directive is not yet published, the President's January 21st call for a more transparent, participatory and collaborative government has already made an impact. The Department of Health and Human Services and Department of Homeland Security have undertaken dialogues with stakeholders to strengthen not only services but also strategy. The Open Government Directive development process itself has included public brainstorming and a wiki to help develop the policy. Each of these projects and tools are part of the learning process to make open government robust and meaningful. It's already happening. This Yellow Brick Roadmap to real accomplishments is meant to help people [you!] believe that we are making progress opening up government. And, to show concrete examples that can be leveraged by people [you!] trying to make progress in your own agencies. The path to success is recognizing that we [you!] are already on the path, that you have the tools/ruby slippers and it's up to you to make it happen. Got it? Have more examples with enough resources for folks to replicate? Add to the comments below. Then, pick up your basket and your little dog, too, and follow the Yellow Brick Road! Great thoughts, Gwynne. Very interesting to see fluid adoptions like the Smithsonian example. Well ... your story really affects somewhere in the cosmopolitan groups of country movers.. whatever it may require to move the country along, one must go for it..and at least tries to get the beneficial output to drive the system (so called) in a proper way with the ease.